Llangrove has an active community with many local events throughout the year. These include local news and events listings. Notice boards There are two notice boards opposite the school, on the bus stop corner. 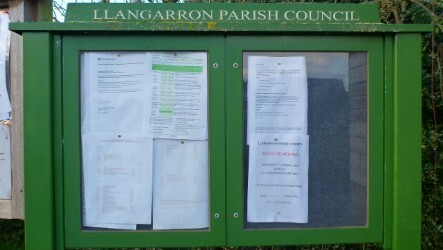 One is for general use, the other belongs to Llangarron Parish Council. The school and church each have their own notice-boards listing events and local information which may also be of interest. Border News The Border Group of churches, which includes Llangrove, publishes Border News, ten issues a year. There is a double issue July/Aug, Dec/Jan. Each church in the group has a small section to advertise forthcoming events etc. In addition there is editorial and space for local tradespeople. This can be delivered to your home for a small annual donation. If you wish to be put on the distribution list, contact Maggie Pridgeon on 01989 770435. Village News This publication also covers several villages but is able to carry photographs of local events and other articles of general interest. 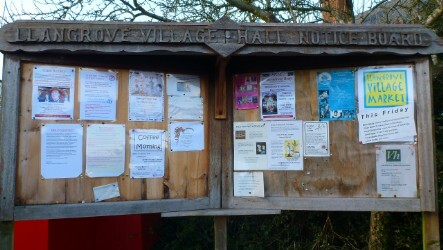 The Village News is available with a suggested donation of 50p. The collection points are: Village Hall, Royal Arms, Christ Church or Woods of Whitchurch.